Sharing the world as I do and see it…. It’s Day 5 of my amazing trip in Europe and I attempted DIY reverse of “Norway in a nutshell” (NIN) from Bergen to Oslo. I took the train from Bergen to Voss, then on to the bus to Gudvangen, onboard the ferry to Flåm and finally took the scenic train journey from Flåm to Oslo via Mrydal. Sound very complicated right? To be honest it wasn’t too difficult since with internet I was able to access the trains, bus and ferry schedules. Then it’s just a matter of planning. One can purchase the NIN tour from the tourist office/agents but I prefer to make my own arrangement which gave me the flexibility to custom made my own itinerary. For this leg of the journey I purchased the train ticket from Flåm to Oslo 60 days in advance to enjoy the minipris rates, which was a great savings. I bought the ferry ticket online and the train ticket from Bergen to Voss a day before the journey. I’m glad I did this the previous evening because the queue was super long the morning I departed from Bergen. As for the bus ticket, I bought direct from the bus driver. I woke up at 5.30 a.m, had breakfast and packed along some sandwiches for the trip. By 7 a.m. I had checked out from the hostel and dragged my luggage to the train station. The objective was to catch the 7.58 a.m train to Voss. The queue was very long, many were on group tour and only a few were independent traveler like me. But most of them were holding NIN tour tickets bought via an agent. When the train arrived, it became chaotic as everybody rushed to get onto the train, it was free seating. I managed to squeezed into the 3rd coach and sat with a group of travelers from USA. They were doing NIN on a day trip returning to Bergen that evening. The train journey from Bergen to Voss took slightly more than an hour, passing through beautiful lakes, waterfalls and small villages. When we arrived at Voss station everyone rushed to the busses 200 meters away waiting to take us to Gudvangen. With 2 heavy luggage, I was among the last to arrived but managed to get a seat and the only one who paid the fare on board since others had the all inclusive tour paid. We passed a few spectacular waterfall and the final descent towards Gudvangen small port was just breathtaking beautiful. One of the main highlights of NIN is the 2 hour journey on ferry from Gudvangen to Flåm. The narrow and spectacular Nærøyfjord is surrounded by steep mountains that stretch up to 1800 meters above sea level. Water falls cascade down the mountains and picturesque villages dot the landscape. This is an area that is featured on the UNESCO world heritage list and is considered one of the world’s most beautiful fjord landscapes. It reminds me of Lauterbrunnen Valley and the Jungfraujoch train ride in Switzerland, though in a different form but there were mountains, steep rocky cliff, waterfalls, isolated farms and small villages. Upon arrival in Flåm, I head straight to the train station and leave my bags at the left luggage. Then I took the bus to Stegastein Viewpoint for a panoramic view of Aurlandsfjord. For 30 minutes ride each way, I found the bus fare phenomenally expensive at NOK300, about RM160 return. However, it is an unmissable sightseeing trip for any visitor to Flåm. The Stegastein viewpoint structure was in itself an extraordinary and spectacular engineering feat. It juts 30 metres (about 100 ft long) out from the mountainside as the land drops away steeply beneath. The end is glass, so you can literally look about 2000 ft straight down. It offers an unparalleled panorama of the fjord, mountains and surrounding landscape, a sight that for a while took my breath away. I returned on the 5 pm bus and have about an hour to explore Flåm before taking the 18:45 p.m. train to Mrydal where I have to wait 5 1/2 hrs for the connecting train to Oslo. You may ask why choose such connection? Flam – Oslo train journey cost up to NOK1,141 and there were only 2 cheaper options which was the 17:30 p.m. or 18:45 p.m. train from Flåm which cost 42% cheaper at NOK659. The later connection allows me to catch some sleep on the train, thus save me another NOK400 on hostel bed. The train journey from Flåm – Mrydal is another highlight of NIN. The Flåm Railway is one of the steepest standard-gauge railway lines in the world, with 80% of the journey at a gradient of 5.5%. The train runs through spectacular scenery, alongside the Rallar Road, vertiginous mountainsides, foaming waterfalls, through 20 tunnels and offers so many viewpoints. National Geographic Traveler Magazine calls the Flåm Railway one of the top 10 train journeys in Europe while in 2014 Lonely Planet Traveller went even further, and named it the best train journeys in the world. When I arrived at Myrdal train station, it started to drizzle and temperature drop. The only cafe at the station was closed. I paid NOK20 for a hot coffee from the vending machine. It’s gonna be a long night. I found a warm cosy corner to sit, and by 8.30 p.m. there were only 5 people left waiting for the 01:06 train to Oslo. The train to Oslo had arrived bang on time but someone was sleeping on my reserved window seat. Not wanting to make a deal out of it, I sat at another available seat. It’s been a long day and all I want was to catch some sleep. After a good rest the previous night, I looked forward to start exploring Bergen. Nothing too strenuous as the aim was to adjust to the different time zone and eliminate any effect of jet lag. The hostel I’m staying has a kitchen, so guests staying here may cook their meal. A compulsory facilities for a budget traveler like me especially in a country like Norway where eating out is SO expensive. After a simple breakfast of coffee and oatmeal, a short self guided walking tour of Bryggen, a UNESCO heritage attraction, was on the card. I grabbed a city map from the hostel reception and after breakfast I headed straight to the harbour, which is only a short 10 minutes walk from the hostel. My first stop is the Fish Market. Set near the harbor, it’s a lively place where one can find not only fish but also fruits, vegetables and flowers for sale. It’s also a culinary treat where locals and tourists alike come here to grab a bite to eat. The atmosphere is a bit like the agro/night market back home in Malaysia. Walking around the market, I past countless stalls selling giant lobsters like the one seen in the Deadliest Catch on Discovery Channel, salmons, caviars and every other imaginable netizen of the North Sea waters. In one of the stalls, I saw a sign “Hvalkjøtt” with chunks of dark smoked meat beneath it. I asked the woman behind the counter what is it? She told me it’s smoked whale meat, and when I asked what it tasted like she told me very much like beef. She then cut a tiny sliver off and handed it to me. It did taste much like salty beef with fishy taste. The whale meat will set you back NOK590, about RM300 for 1 kg. Then I came to a stall selling boiled shrimp. Very pricey but again the lady behind the counter offered me to taste the shrimp. I can taste the sweetness of the fresh shrimp and it was really yummy! 😋. From the Fish Market I walked along the wharf. Next stop was Hanseatic Museum. The building was built in the 14th century by German merchants as their trading office. There’s an entry charge of NOK 150, about RM80 (1 NOK = RM0.55). I just had to pass on this one. Bryggen showcases a lovely row of traditional wooden shops facing the harbour. Reminds me of Amsterdam and my hometown Malacca except that the buildings here are very colourful. Today the shops mainly sell souvenirs aiming at the megacruise tourist market. I’m afraid window shopping is the recipe of today. Everything seemed VERY expensive. At the end of the wharf stood Rosenkranz Tower and Haakon’s Hall. The tower was the residence of King Eirik Magnusson, who was the last king to hold court in Bergen, until he died in 1299. It has been converted into a city museum. Entry charge is NOK 80, about RM45. Something more palatable for my pocket for a bit of history but unfortunately it’s partly closed for major maintenance. As I continued wandering behind Bryggen, I passed Mariakirken, said to be the oldest church in Bergen, dated back in 1180. Then I must have taken the wrong turn. For a moment I was lost trying to get back to the wharf and came across a residential neighbourhood, Kroken Street, a charming, cobbled pedestrian lane lined with wooden houses. There was a lovely small park with large old trees and benches. I continued exploring the neighbourhood and came across some street arts, art galleries and nice little cafes. Overall it’s a delightful walk which had to end abruptly when the rain started pouring. Back at the hostel, I prepared a simple pasta dish for dinner and planned for my 1st hiking in Norway. Well that was the plan anyway. The weather did get worse the following day. It was cold and windy with intermittent rain. I decided not to go up Mt. Ulriken but instead on the second day I explored the picturesque Nostet neighbourhood. Later that day I hangout around the harbour, overlooking Bryggen with Mt Floyen in the background. What a feeling when the sun finally broke out through the thick cloud. On my last day in Bergen, the weather still did not let up. I was disappointed because I couldn’t attempt the Vidden trail from Mt. Ulriken to Mt. Floyen. But I did take the funicular up to Mt. Floyen. The condition still not ideal for a short hike. It was too windy and the wet and slippery rocky path was too risky for my weak knees. Despite the foggy condition, the view from top of Mt. Floyen was still breathtaking. Before returning to the hostel, I dropped by at the train station to purchase the next day train ticket to Voss using the vending machine. I’m glad I did, but that is another story to tell. It has always been a pleasant experience to fly on Malaysia Airlines to London, and I look forward to fly on their new A350-WB. But they had used the bigger A380 instead because of high passenger demand in summer. I managed to get a descent amount of sleep during the flight. MH2 arrived in London Heathrow 30 minutes earlier than scheduled and provided me plenty of time to connect to my next flight. Because there’s no interlining between Malaysia Airline and SAS, I need to go through immigration, collected my checked luggage, transfer by tube from Terminal 4 to Terminal 2 and checked-in into the next flight. It can be stressful but Alhamdullilah it went smoothly. SAS was kind enough not to charge me with the access baggage. All the anxiety had gone and I still had 2 hours to spare before boarding, enough time for a cuppa and stretched my legs before the next leg of the journey. In all it was 24 hours of flight time plus transfer and transit. The flight from Oslo to Bergen was a couple of hours delayed. By the time I arrived in Bergen, I can only think of a good bed to rest. Glad that I have booked a bunk bed in a dormitory at Marken Guesthouse instead of camping. From the Bergen Airport I took the bus to Bergen Busstasjon in the city centre. Then it’s about 10-minute walk to the hostel. What I didn’t expect was mostly they are cobbled streets. So dragging 2 bags on wheels were not as straight forward easy. The staff at the hostel reception was very friendly and I was given the key to my shared dormitory on the 4th floor. The cost is NOK345 per night and it has free Wi-Fi, For now, it’s time for me to get some rest. Do keep following and see you in my next post. After a painful 17 month saving plan, the time had finally come for another solo trip. This time I’ll be covering land of the Vikings, the Baltic states, Eastern European capital cities and Greece over the next 2 months. In all I will be vis\niting 10 countries. I will share the detail of the trip route as we go along. Keeping in mind that I’ll be hopping between flights, trains, buses and ferries. in and out of hostels/hotels, another challenge was to pack as light as possible. With a varied climate of the places I intend to visit, it didn’t make the tasks any easier. The checked luggage must not exceed 20kg, the limit of many budget airlines in Europe. That was the plan. It was easier said than done. By the time I had finished packing, I knew I had gone over the limit since I struggled to lift the luggage. Once I had it weighed at the airport, I was almost 12 kg over the 20 kg limit I had set. I took out almost 5 kg and that brought me down to 27kg. No problem with Malaysia Airlines since I have a 30kg baggage allowance, but my onward flight to Norway via SAS only allows me 23kg. That means I have 4kg of access baggage. In the bag I have basic clothing for 4 days which include a pair of jeans, hiking pants, waterproof pants, 2 T-shirts, 1 long sleeve shirts, 2 pairs of merino thermal inners, 2 pairs of hiking inners, 1 fleece, a pair of short, 1 swim suit, 2 pairs of merino socks, 2 pairs of normal sock, a towel, 4 pairs of underwear, toiletries, packs of wet tissue, a pair of hiking shoes and a hotel slipper, battery chargers, power converter, a walking stick, a tripod, a waterproof daypack, a thermos, a water bottle and a small tupperware. I also packed along some food from rice, instant noodles, canned food, aunchovies’ sambal, fruit cakes, instant coffee, milo, tea bags and a few zipper bags which were the main contributor to the access weight. In another bag, I have a spare change of clothes, a tooth brush, a pack of wet tissue, a laptop, 2 powerbanks, a mobile phone, a headphone, a weatherproof jacket, a winter jacket, 2 cameras, travel documents, a small notebook and some snacks which I carry on board the flight. Since there is no direct flight from Kuala Lumpur to Norway, I had purchased a one-way ticket to London Heathrow using air-miles I accumulated travelling on Malaysia Airlines and the Enrich miles collected from utilizing my credit card over the past 2 years, and connect via Scandinavian Airline (SAS) to Bergen in Norway. The KUL-LHR sector only cost me RM80, so it was a great savings, whilst the LHR-BGO sector cost me €260 (RM1,313). Actually, there is a cheaper flight to Bergen from Gatwick, however I need to overnight in London and plus the transportation cost to Gatwick, the total cost come to almost about the same. This was a trip we did in October 2014. Initially we had planned to rent a car from London for a driving tour. However, after further research we had changed the plan and took the bus to Bath, overnight there before picking up our car rental the following morning to explore Devon and Cornwall. That way we avoided going through the London traffic and paying high parking fees in Bath. Our National Express coach departed from the London Victoria Coach Station at 9:00 a.m. and we reached Bath 2 hours and 45 minutes later. Alternatively one could take the train from London to Bath for slightly over an hour. It’s difficult to beat the fun fares offered by National Express which only cost us £10 return per person, thus our decision to take the coach instead. We had booked a night accommodation at Bath Backpackers, only 2 streets away from the coach station. By 12:30 noon we were all set to explore the city. It was our first time in this historic city and we wanted to make the most of our short time here. We started our walking tour from the Royal Crescent. Built between 1767 and 1775, the crescent contains 30 houses. One of it is occupied by the Royal Crescent Hotel. Walking back towards the city centre, we take in the magnificent Circus. It is said that when viewed from the air, the Circus forms the shape of key. 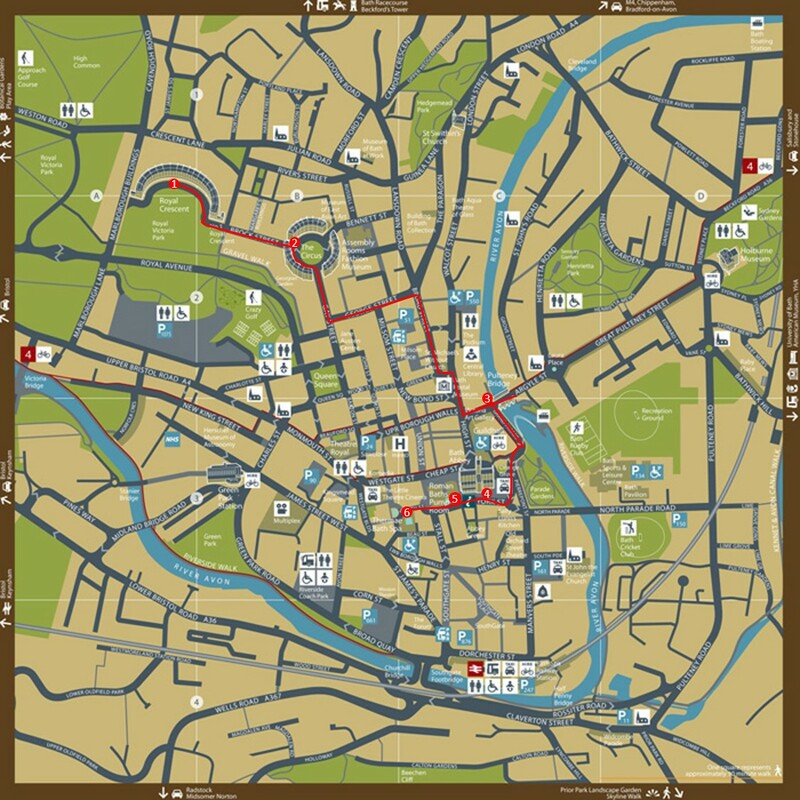 The striking architecture has spawned numerous theories to explain its stark originality influences and one of the key reasons Bath was awarded the title of World Heritage site by UNESCO. We then passed in front of Holburne Museum as we head down to Pulteney Bridge. The bridge resembles the Ponte Vecchio in Florence and also has shops built on it. Truly the setting is breathtaking. We spent some time over here viewing the bridge from every angle possible and the view from the Parade Garden parks by the crescent weir is probably the best. I did came back later that night for some night photoshots of the bridge. Our next stop was the Bath Abbey. The abbey is another great example of architecture that creates extraordinary experience of light and space with its magnificent stained glass window, tall honey-gold stone columns and some of the finest fan vaulting. Entry to the abbey is free but there is a charge of £6 if you wish to visit the tower. We have lost count of the time, it was already 3:00 p.m. by the time we finished exploring the abbey. No wonder I felt hungry as we didn’t stop for lunch. We went to the Roman Bath. It was nothing like what we had experienced before and I would highly recommend this place. If you could only have time to visit one place in Bath, please do not miss the Roman Bath. Single entry will only cost visitor £13.50. After many walking tours in London and Bath in the past 6 days, the 2 hour hot spring bath at Thermae Spa was a great way to ease the aching joints and tired legs. We really enjoyed it. Another bonus was the fantastic view of the city from the roof top pool (we can’t share the photo as camera is not allowed) and what a way to end the city tour before we head back to our hostel. Sharing with you another of my travel memoir in London. Day 3 was filled with a tour to Harry Porter Warner Bros studio. A must for any fans of the box office film series. A chance to experience the wizardy world and learn to fly on a broomstick. 11 x 8.5 Medium Landscape Imagewrap Hardcover London 2014 Part2. It has been quite sometime since I post something about my travel experience. I had just finished with my photobook project on a recent trip to London. Click on “london part 1” at the bottom, for a sneak preview of the photobook in pdf version, covering our first 2 days in the city. May be you can pick up some tips. Happy reading. I’ve been to Thailand a few times, however this time we did it when the country is in political turmoil. But I’m glad that we went ahead and didn’t cancel the trip despite warnings from some quarters that it’s not safe and travelling to Thailand is at best be avoided. Arriving on late Friday night at Survanabhumi International Airport, we took the public taxi to our hostel in Bangrak. The ride was slightly less than an hour and cost 500 Baht (without meter). We have booked a room at i-sanook Residence in Bangrak, a very comfortable upscale hostel that has private rooms with ensuite toilet, offers complimentary breakfast, a guest kitchen that allows you to cook, a swimming pool and a gym. It also offers complimentary Tuk-tuk ride (from 8 a.m. to 5 p.m. only) to Si Phraya Pier or to the nearest subway or BTS station. I have 6 leisurely days, it’s free & easy with no pre-planned itinerary. The first day being Saturday, a visit to the weekend Chatuchak Market beckons. Chatuchak is arguably one of the biggest market in the region with more than 10,000 stalls, opens only on Saturday and Sunday from 8.00 a.m. to 5.00 p.m. It’s not difficult to find something of one fancy; ceramics, puppets, essential oils, bags, blouses, beads, bronze and copper bowls, arts of all kinds, t-shirts and souvenirs, even pets can be found here. After breakfast at the hostel we took the Sukhumvit BTS line to Mo Chit. The market is very crowded with shoppers; locals and tourists. Passing through the crowded narrow alleys is in itself can be a challenge. Some of the shops do look alike and occassionaly I lost the sense of direction. The place can really overwhelmed you. The best is to be patient and take things slowly. In this trip I have also noticed a few new food stalls with “halal” sign. But we went to the one near clock tower and to my surprise the owner looked exactly the way I remembered her 7 years ago. The place was full and we were lucky to get a table near a boiling pot. “Hot and stuffy”, we ordered “mee celup” and chicken briyani and ate our lunch quickly. For me Chatuchak is a great place for some retail theraphy. The price is generally lower than home (Malaysia) but we still haggled hard for better price and went home a satisfied shopper. There are plenty of “halal” eateries, so I could shop till I drop and not getting hungry. When my feet starts to hurt, I just stop at one of the are air-conditioned foot massage parlour. It costs 180/250 Baht for a 30 minutes/1 hour foot massage. One could easily spend half a day here and I have seen serious shopper end up going home with a full suitcase after spending a whole day here. If you can’t stand the heat and crowd at Chatuchak Market, Asiatheque has similar offerings with less crowd but the price is more expensive. Opens from 5 p.m. to 11 p.m. everyday, it is an option for those who are not in the city during the weekend. To get there, take the BTS to Saphan Taksin and there’s the free ferry ride to Asiatheque. Bangkok is also popular with quality custom-made tailored suit, shirt or pants. There are plenty of choices at Nana and Sukhumvit area. Prices ranges from 5,000 Baht to 10,000 Baht for a suit, 700 Baht to 1,500 Baht for a shirt and 1,500 Baht to 2,000 Baht for a pants depending on the type of fabric. Most are closed on Sunday and it takes between 2-3 days to have it done with at least 2 fittings. Based on some good reviews found in the internet, I decided to try Custom Tailor on soi 8. I got my measurement done on Saturday after the visit to Chatuchak, but due to “Bangkok Shutdown” on Monday 13/1/2014, I could only do the 1st fitting on Tuesday evening. That’s not a problem for me because I wasn’t due to return to Kuala Lumpur until Friday morning. Despite the ongoing protests in Bangkok, it was business as usual. Unaffected by “Bangkok Shutdown”, on the last day of this trip, we decided to spend some time near Siam for another retail theraphy at Siam Square, Paragorn Mall and HRC Bangkok. This is probably the closest we got to the much talked protest in Bangkok. Things were still in orderly manner and sometimes it felt like a carnival. The Thai people are in election mood. T-shirt, headband, ear rings etc all depicting the national flag are on sale. We even joint the crowd on the street for a taste of what it’s all about. After a short stop to see Angel of the North, I was on the road again, driving south along A167 into Durham County. Durham City is another beautiful university town with its fascinating castle and cathedral. But this time around I’m skipping Durham and head straight to Teesdale, an area I haven’t explored before. To be honest I didn’t have a specific plan which made this aimless drive somewhat less stressfull. When I came across a big signboard stating Raby Castle, 2km further up, I made a decision to check it out. There’s an entrance charge of £6 to the parks and garden or £10 if you want to enter the castle too. I decided to do some short walks around the castle parks and garden and paid the £6 charge. I was a given a small pamphlet with a map and a short history of the castle. The castle sits on 200 acres land and said to be one of England’s finest mediaeval castles. Even from the car park, the 14th century castle do look great, a fortress that stands proud and defiant. “King Cnut also known as Canute II the Great owned the Estate in the early 11th Century but it was the Nevills, one of the most powerful families in the North who built the castle. 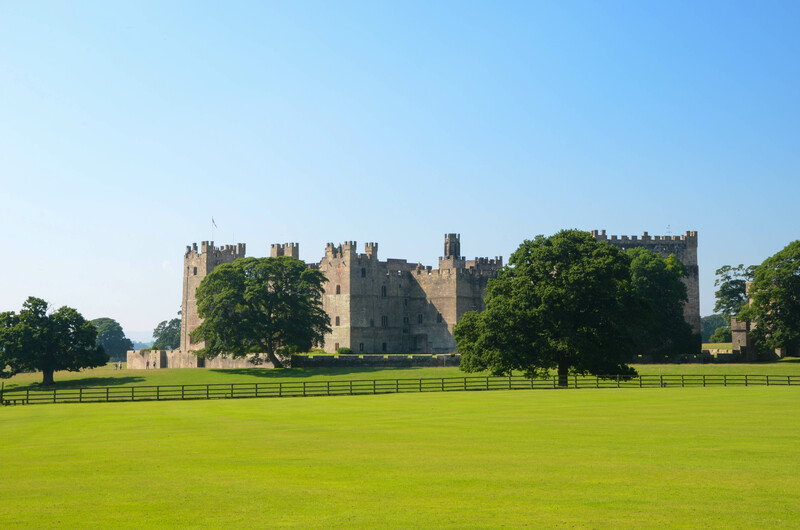 After Charles Neville, 6th Earl of Westmorland, led the failed Rising of the North in favour of Mary, Queen of Scots in 1569, Raby Castle was taken into royal custody. Sir Henry Vane the Elder purchased the castle in 1626 from the Crown. The castle is currently owned by Lord Barnard”. The first part of the castle that I explored was its beautiful English garden. Parts of the garden are walled that provide one with privacy. If this is my garden, I could see myself spending my free time seating in one of the benches with a good book to read. There are the two fine old yew hedges, formal lawns, an ornamental pond, garden filled with roses, heather and conifer. With 200 acres of park land, there are a few paths one could take. The footpaths are uneven but can be easily walked. After walking for about 20 minutes, I could see from a distance a herd of deer sitting under the shades of trees. I walked slowly towards them for a closer look. However, some seem to be bothered by my presence and started to walk away. Hiding behind a tree, prepared with a Sigma 150-500 mm zoom lenses, I was able to capture some shots without getting too close to them. There are two types found in the park; the Red deer is the largest British wild land mammal, and the smaller Fallow deer, both herds are said containing the descendants of deer preserved in this area since Norman times. On the other side of the park, there’s a large lake which gives a fantastic view of the castle. It’s one picture perfect spot not to be missed. I wished the water in the lake had been calmer for me to get a beautiful picture of the castle with mirror like reflection. There’s also a story that the castle is haunted by Charles Neville, who was once the Earl of Westmorland. Charles was forced to surrender to Henry VIII after the unsuccessful Rising of the Northern Earls. His ghost is often seen heading for the Barons Hall, where in 1569 he and his men were deciding whether to stand up against the King, They were interrupted by Mrs Neville who hearing their discussion called them a bunch of sniveling cowards. In response to this provocation, the men went to battle and lost. The Earl was forced to flee to Scotland, and then on to Holland where his body is now buried. Angered by the persistent humiliation by his dead wife, Charles’ ghost did appear, giving Hamish a proper Glasgow Kiss for his efforts. I had an early lunch at the castle’s cafe, tuna sandwich and lime juice to quench my thirst on a very hot day before continuing my journey to a historic market town the locals called “Barney”. About 2 miles from the town centre is Bowes Museum. I didn’t enter the museum but instead admire the beautiful setting of the magnificent French style château from its garden. From here I made my way to Upper-Teesdale. The road is good but it can turn out to be dangerous as I had difficulty in keeping my eyes on the road. The beautiful scenery of rolling hills with grazing sheep, isolated farmhouses and cottages were a big distraction and I almost drove into a ditch. I reached High Force Hotel hoping to get a room for the night. But I was unlucky as it was full. Blimey!!! My fault for not making any reservation. It’s Bank Holiday Monday and it seems all the B&B in the area had no vacancy. The only plan B that I had was overnight in the car. Oh!!! What an end to an almost perfect day. After cleaning up and putting dry clothes on, I was able to put things into perspective. Firstly, I thank God that I’m still in one piece without carrying any major injury. I still have my little camera and phone camera to capture moments of the remaining of this trip. The images in the memory card were intact and I’m able to share them here. Things could have been far worse. I returned to Barney, find a bright spot in the parking lot, had fish and chips for dinner before retiring in my car for a much needed rest. The following morning, I woke up to the sound of my alarm clock, it was 5.00 a.m. Others in the dorm were still fast asleep and one of them was snoring loudly. The rain had stopped and breakfast would only be served from 7.00 a.m. I decided to go for a short walk over the Tyne Bridge, a prominent landmark in Newcastle which resembles the Sydney Harbour Bridge. 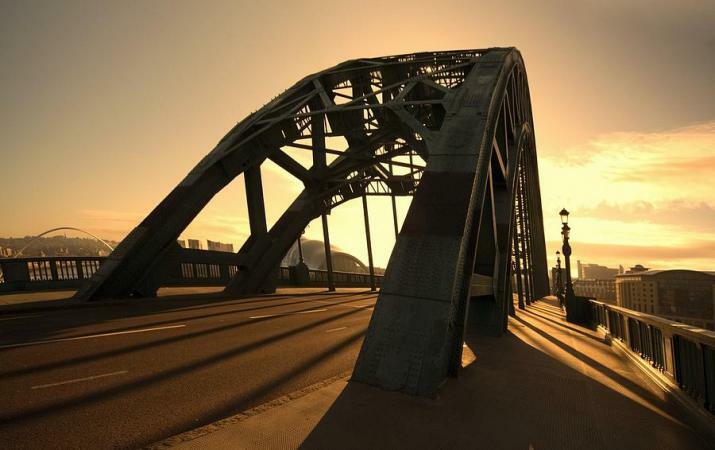 There was little traffic in this early hour, and for the first time I had used my new Cokin Filter to capture a descent photo of the bridge during sunrise. The weather was forecasted to be cloudy but no rain. It was a perfect day to explore the city on foot. After another hefty breakfast at the hostel, I was back on foot to explore the city. I wanted to see more of the city and wonder how much it has remained or changed after 23 years. My first stop was Grey Street, which is only 2 blocks away from the hostel. The street lies within “Grainger Town”, a beautiful and historic heart of the city with classical streets built by Richard Grainger between 1835 and 1842. Some of Newcastle upon Tyne’s finest buildings can be found along Grey Street include the Theatre Royal. The theatre which was opened in 1837, presents more than 380 performances a year. It is the third home after London and Stratford-upon-Avon of the Royal Shakespeare Company. If you like theatre performances, the tickets here are a lot cheaper compared to those in London. Listing of performances can be found at http://www.theatreroyal.co.uk. One could not miss Grey’s Monument, located on the upper end of Grey Street dominates the square. Built in 1838 in remembrance of Charles Grey, the 2nd Earl Grey. The square is a popular spot for people watching, buskers, fairs and protestors demonstration. An entrance to Central Arcade, a beautifully preserved Victorian shopping arcade, could also be found nearby. Everything looks familiar but I can see that the al fresco restaurants and bistro culture have really catched up in the North East. From Grey Street, I entered Northumberland Street, the main shopping high street in Newcastle. Fenwick department store is still at the same spot. I remembered how during every winter and summer sale I will come looking for bargains to complete the Eternal Beauty tea set that I was collecting. Newer high street department stores such as Primark can also be found here. I came across a Vodafone shop and bought a data packet for my phone which allow me to surf the internet and keep in touch with friends through social media network and email. When I passed over Argos, I can’t help myself from not smiling. There were a few occasions I bought a camera and video player, used it extensively and return in less than 30 days from date of purchase. It was one of those money back guarantee policy that was abused and used to my advantage. Finally as I approached Haymarket, a familiar Newcastle University buildings came into sight. Opposite of the university campus, is a small park which housed the Civic Centre and Church of St Thomas the Martyr. The grounds also include various war memorials including The Response, 1914 by Goscombe John, said to be one of the finest sculptural ensembles on any British monument. I also noticed that the university has a few new buildings. What was an empty park in front of the Student Union Building is now a theatre. Modern looking wooden benches have been put along the path leading to the Student Union Building. Unfortunately I was not able to enter the building as access is through the student smart card. I remember that I will come here for the cheapest sandwich in town. As the Malaysian Student Society treasurer, occasionally I had to visit the student bureau to apply for funds for the society activities. The Student Union Building is also a good place for information. There was a huge notice board for lost & found, buy & sell, lodgings etc. The building basement was also used to host gigs by upcoming bands. One of my favourite part of the university is the Armstrong Walk, some referred it as the University Quadrangle. It is lined by the university’s oldest building which housed the School of Architecture, Fine Art Building and the Old Library Building. Convocation would normally be held at King’s Hall here. My final stop is the Great North Museum also known as the Hancock Museum managed by the university. The museum displays some outstanding natural history collections from the Ice Age era to the history of Hadrian Wall, the Egyptians and Romans. What I like about this museum not only entry is free but you are allowed to take photographs. Since it was a Bank Holiday weekend, many of the shops were offering discounts up to 70% discount. I spent the rest of the afternoon browsing at shops along Northumberland Street and in Eldon Square. My only purchase for the day was a light weatherproof jacket by Northface. It would cost more than RM500 in Malaysia but I got it for RM250 here. Later that evening, I went for a stroll along the Quayside. Walking along the waterfront of River Tyne has always been my favourite pastime but again my expectation for a quite walking experience fell short as the place is now a lively waterhole with a string of pubs and restaurants. I could see the new additions to Newcastle cityscape, the Millenium Bridge and the Sage. There are plenty of great viewpoints, the cloud has cleared and I had my tripod with me for the evening shots. The following morning, after breakfast I checked-out from the hostel and picked up my car rental. It’s bye-bye Newcastle for now. I took the A167 to see one of the city’s new attraction, Angel of the North before venturing into Durham County.